Factbox on India's Sourav Ganguly after he became only the third batsman to score 10,000 runs in one-day internationals on Wednesday. Left-hand bat, occasional right arm slow-medium bowler. Test debut: v England, Lord's, June 1996. 82 Tests. 4949 runs, average 40.90. Eleven centuries. One-day debut: v West Indies, Brisbane, January 1992. 271 matches, 9967 runs, average 41.18. 22 centuries, 60 fifties. Stylish left-hander with flowing off drives, rated among leading one-day batsmen, particularly for his prolific opening partnerships with Sachin Tendulkar. Weaker against sharp pace and short bowling aimed at rib cage. India's most successful Test captain with 19 victories from 47 matches. 1992 - Made India debut aged 19 in a one-day tri-series in Australia, but discarded after one game which critics and media attributed mainly to his poor attitude. 1996 - Recalled for Test tour of England amid intense media scrutiny. Scored 131 on debut at Lord's and 136 in the next Test at Trent Bridge. 1999 - An average season with English county Lancashire. Dubbed "Lord Snooty" by the British media for what they called his boorish behaviour. 2000 - Appointed India captain during a home series against South Africa after Tendulkar quit the job to focus on his batting following a 3-0 Test series rout in Australia. 2000 - Linked up with New Zealander John Wright, appointed India's first foreign coach. Credited with backing youngsters such as Harbhajan Singh, Yuvraj Singh and Virender Sehwag to help them overcome hiccups early in their career. 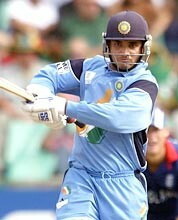 2001 - Leads India to a stunning 2-1 comeback home Test series victory over Australia despite poor batting form. Heavily criticised for making rival captain Steve Waugh wait by repeatedly arriving late for the toss, but hailed as a hero at home. 2002 - Leads India to a 1-1 Test series draw in England, the team then sharing the ICC Champions Trophy with hosts Sri Lanka. 2003 - Captained the team to the World Cup final in South Africa, India's first since their shock 1983 victory. 2003/4 - Shook off poor form to hit a flowing 144 in the drawn first Test in Brisbane, inspiring India to a creditable 1-1 Test series draw in Australia. 2004/5 - Position in team under scrutiny due to poor batting and fitness. Handed two-Test ban for his team's slow over rate in a one-day defeat versus Pakistan in Calcutta, but appeals successfully. April - Banned for six one-dayers for his team's slow over rate in two consecutive defeats in a 4-2 home series loss against Pakistan. Indian board left him out of last two games of the series and the ICC imposed punishment retroactively after an unsuccessful appeal. July - Rahul Dravid named captain for one-day series in Sri Lanka. August - The ICC arbitrator reduced ban by two games after the Indian board's second appeal, allowing Ganguly to re-join squad after missing first two matches in Sri Lanka. August 3 - Reached 10,000 one-day runs by scoring 51 on his return in Dambulla, Sri Lanka, becoming only the third player ever to achieve the feat behind Tendulkar and Pakistan's Inzamam-ul-Haq. The chronology will benefit those with a sense for post modern history. Thanks.